Official Site: We guarantee our best prices are available directly through this Official Website "Book Now"
Come experience lodging chock full of Southern charm sprinkled with modern amenities that you will not find in any hotel in our area. The White Oak Manor is a 1920’s home built by the first county extension agent in the Greek revival style that was so popular during the turn of the century. 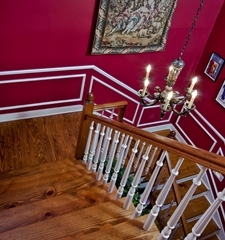 We are located in the Historic District of Jefferson, the Bed & Breakfast Capital of Texas. Come take a step back in time when life was not so fast-paced and hectic. We invite you to come enjoy our signature “warm and friendly” atmosphere. Relax and “sit a spell” on our front porch and relish the peace and quiet where you’ll most likely see a family of squirrels jumping in the tree tops or the bright red cardinals flying about. Offering the best in bed and breakfast lodging and hospitality, The White Oak Manor is a welcome alternative to hotels and a perfect destination for visiting all that our area has to offer. Many attractions are within just a few miles from our front door. 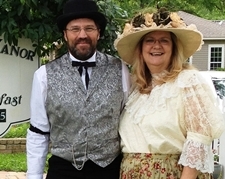 David and I are very proud to belong to the Texas Bed and Breakfast Association. The Association holds its members to standards that we welcome. We are the only bed and breakfast in Jefferson Texas that has been inspected and approved by TBBA. Each of our bedrooms are tastefully decorated for the particular feel of the room.Three guest rooms are located on the second floor of the house and our two new guest rooms are located on the first floor. Our rooms feature central air conditioning, large ceiling fans, private en-suite bathrooms with claw foot tub and shower combinations, in-room mini fridges, coffee/tea stations, 37″ flat-screen TV with basic cable programming, and FREE Wi-Fi throughout. Our daily gourmet breakfast will give you the energy to enjoy your day. Do you have a special occasion to celebrate? Let us enhance your visit with one of our Texas vacation Packages, made especially for your stay. We would be happy to help make your birthday, honeymoon, anniversary, girlfriends’ getaway, or romantic retreat all it can be. Jefferson, Texas is a vibrant small town with a rich history filled with tales of the Civil War, ghosts, and paddlewheel boats on the river bringing supplies for the new territory expansion. Today, you’ll want to take a ghost walk tour, ride a boat upriver and imagine the huge boats that once traveled the same waterways, or spend the afternoon shopping in one of the many antique shops that now line the streets. When you’re ready for some refreshments, pop into any of the area’s welcoming cafes for a bite to eat. Porch parking has become an art form here. Come for a visit and we’ll introduce you to it. With the Spring Season everything is blooming and brightly colored. As you drive around town you will see all the beautiful flowers and trees. Perhaps an afternoon ride along the streets in a horse drawn carriage snuggled up together is your idea of a perfect day. Or if your heart is set on just meandering the shops in Jefferson and coming back for a relaxing evening with a glass of wine, that is alright with us too. It is all up to you, do a little or a lot!